In an earlier article in Micscape I discussed the eyes of molluscs. In this article I will try to give some insight into the ways an insect sees the world. Insects can have a number of eyes and moreover, eyes of different types; single eyes and compound ones. In contrast with our eyes, insect eyes are immovable and unable to focus. Insects are short sighted. Butterflies are probably the most far sighted, they can see perhaps a few meters, while bumblebees only have a range of a half meter. But many insects are helped a lot by their sometimes unbelievable sensitivity for scents. It is of course impossible for humans to perceive what an insect sees. But we think that a compound eye, consisting of 2 to 30 000 lenses will project a sort of mosaic picture. In most cases the compound eyes will see only form and movements, but the dragonfly, who has to catch his prey in flight, undoubtedly must have a detailed view of his near surroundings. With its two enormous compound eyes, each made of 30 000 lenses and the additional single eyes, the dragonfly is very well adapted to its predatory and active life. Insect eyes can change considerably between the larval and the adult stage. When you look into the details of the compound insect eye, there are many differences when you compare them with our eyes. But amazingly there is a very close resemblance between the genes that control the development of eyes in a house fly and in man, making it a little bit easier to understand the many times that eyes developed independently in different classes of animals. Other sets of control genes cause the differences between animal groups. (A gene is a stretch of DNA in a cell nucleus with the information, necessary to make enzymes, the proteins that regulate all cell functions. Control genes regulate other genes, by switching them on and off). 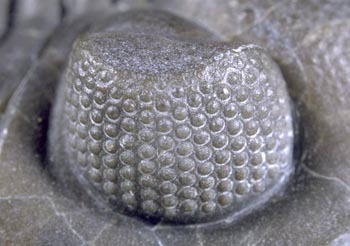 We find compound eyes even in trilobites, crustaceans already present 500 million years ago. The lens parts of their eyes are often marvellously preserved, due to the fact that the material of these eyes consists of calcite crystals. Even more amazing is that these lenses are biconvex, composed of a doublet, a construction developed by Huygens and `Descartes, to correct for spherical aberration. Evolution constructed these eyes half a billion years before man thought of it! 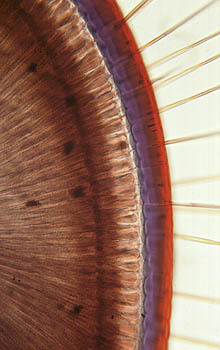 When we look into more details of a compound insect eye, we have to learn the terms that describe such an eye. One single, complete eye, situated in a compound eye, is called an ommatidium.. On the outside we find the lens, directly followed by a crystalline cone. 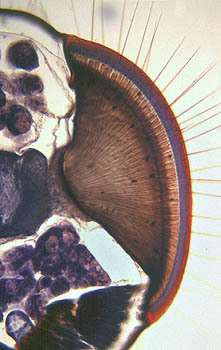 The cone is connected to long cells, called the rhabdome (in fact the photoreceptor surface), surrounded by several retina cells, which secrete the rhabdome. Crystalline cone, rhabdome and retina cells are surrounded by pigment cells that have the function of optically isolating each ommatidium from its neighbours. The retina cells are connected to nerve cells, leading to the optic ganglion. In insect species that are active at twilight or at night we find that the rhabdome is not connected to the crystal cone. Consequently the ommatidia are not completely isolated from each other, leading to a better light yield but also resulting in a less sharp image. Both types of eyes are combined in mayflies. In some night owls the light yield is improved by a reflecting layer. We see their eyes lit up in the dark when we direct a light beam at moths. Seeing is a photochemical process. Photons are caught on the rhabdome by a compound that we call retinal. When it absorbs light energy, retinal changes its form from bent to straight. Retinal is connected to a membrane bound protein, opsin. This complex is called rhodopsin. When retinal changes its form, it separates from the rhodopsin and the opsin triggers a nerve cell. The nerve cells conduct the signal to the brain, telling the brain that the rhabdome has seen a photon. (The free retinal will later be reduced to vitamin A, and in a second reaction, from this vitamin retinal is formed again, which recombines with the free opsin. That is why we need vitamin A for a good night vision). Seeing, by a human or by a bumblebee, is a process of incredible subtlety. As microscopists we can at least see an important part of the apparatus involved in this process! 1. S. Sutton-Vane, The Story of Eyes. Phoenix House 1960, London. 2. W.H.Freeman, Brian Bracegirdle, An Atlas of Invertebrate Structure. Heinemann Educational Books, 1971, London. 3. Kurt Fiedler, Johannes Lieder. Mikroskopische Anatomie der Wirbellosen. Fischer Verlag, 1994, Stuttgart. 4. P. Suppon, Chemistry and Light, Royal Society of Chemistry,1994, Cambridge. 5. Riccardo Levi-Setti, Trilobites. 1993, University of Chicago Press. The pictures of honeybee's eyes were taken from a slide made by Johannes Lieder. 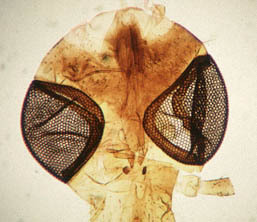 The picture of the crane-fly's head was taken from a NBS slide.